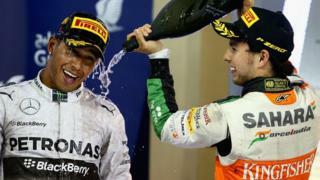 Sergio Perez says claiming his first podium finish for Force India at the Bahrain Grand Prix is an "amazing feeling". Also giving their thoughts on a thrilling race in Sakhir are are Red Bull's Daniel Ricciardo and Sebastian Vettel, Williams driver Felipe Massa, Ferrari's Fernando Alonso and Jenson Button of McLaren. Perez's third place is only Force India's second ever podium, and the Silverstone-based team's best result since Giancarlo Fisichella took second place at the 2009 Belgian Grand Prix.